I round the corner, roller bag in tow and see the doors of the elevator start to close. I hurried to ask the occupant to hold the door, but opted for the daring move of sticking body parts into closing metal doors that could surely crush your skull. The doors opened back up as I stepped into the elevator. Carrie, as she later introduced herself, apologized for hitting the wrong button to keep the door open. 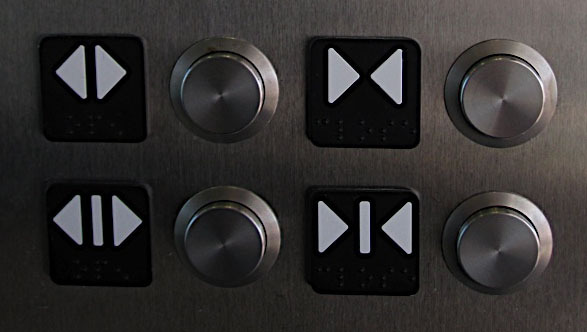 So for the next 8 floors, we discussed and laughed about why elevator buttons for opening and closing the door were inappropriate icons, which has me wondering, what else it just wrong in the way of user interface that we just accept, and sometimes struggle with. Since I could not think of any that cause us to come close to the possibility of loosing an arm or a leg should the safety mechanisms fail, today's list is technology news.